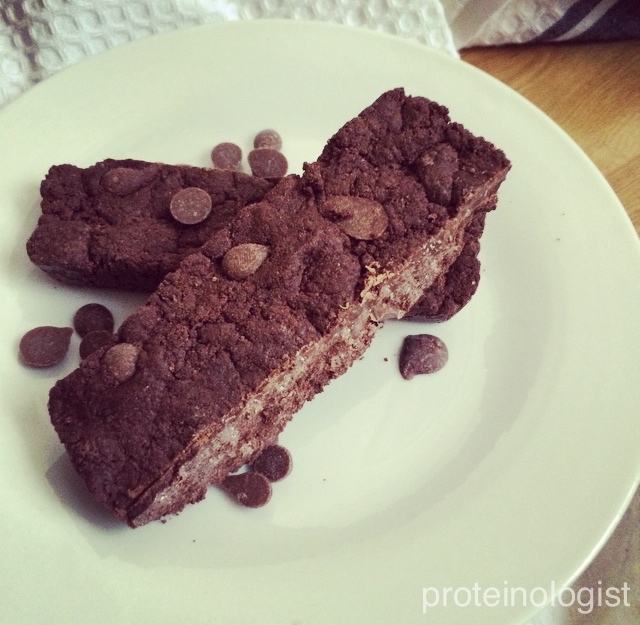 Doubley chocolatey with a protein punch! Melt 4 tbsp coconut oil and set aside. Mix in a bowl 4 scoops chocolate whey, 1/2 cup cacao powder, 1/2 cup PB2 and then add the coconut oil, 2 tbsp honey, 1 tbsp almond milk to form a batter. Stir through 4 tbsp chocolate chips. Press the bars into silicone mini brownie pans and leave to set in the fridge over night. Cut the bars up into equal sized pieces and leave stored in the fridge or somewhere cool.